WHILE a number of Heavy Woollen sides have enjoyed considerable success over the last 12 months, 2018 was a year of struggle for Shaw Cross Sharks. An early change of head coach did little to arrest the slide in Division One as the Sharks suffered relegation, winning only four league matches all season. After struggling to field a team for some games, player-coach Paul March is optimistic that brighter times are ahead as they embark on this year’s Division Two campaign. 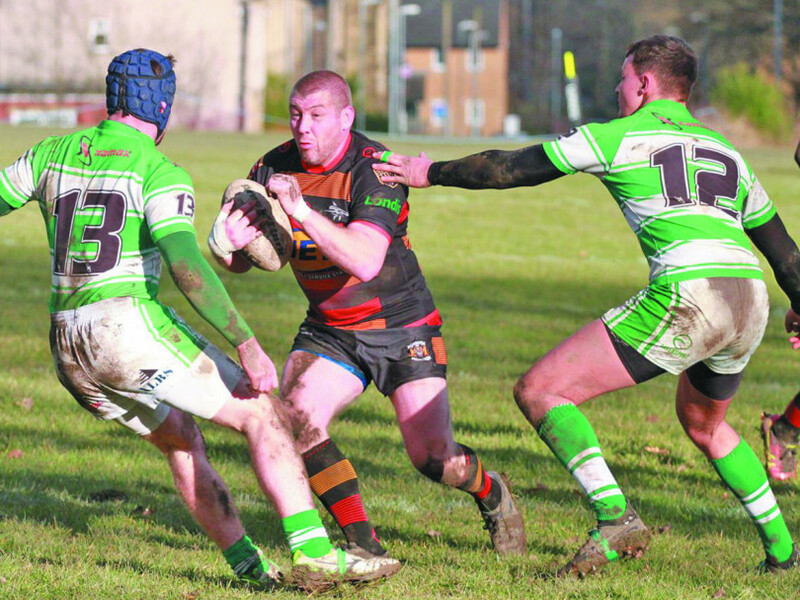 There is a new coaching structure at the top, with the ex-York, Hunslet and Keighley boss assisted by second-team coach Danny Flowers and under-18s chief Mat Cawthron. March has been able to report that numbers are up in training, aided by a number of new talents who are being given their chance in the first team. “The pre-season last year was one session on the field and one session in the gym, and I felt that we didn’t have enough workload in our legs for when the season started,” explained March. Their pre-season matches have produced mixed results, with victory over local rivals Dewsbury Celtic in a friendly before defeat to Haydock in the Challenge Cup. However, there were still positives for March following their cup exit in the performances of the youngsters who have been brought into the side. “I thought Henry Dave was excellent, he carried the ball really strongly for his first hit out,” he said. One in particular caught his eye though, in the shape of 17-year-old back-rower Elliott Richardson. “I thought he was outstanding last week at Dewsbury Celtic but (in the Challenge Cup) I think he’s grown from an under-18s player to a first team player. Physically he held his own and looked good, so I’m excited as to what he can do. March admits that the two games came “a bit too early for us after the rebuilding”, but the Cup exit means that the team can now focus on getting things right in training ahead of the big kick-off on March 2. While getting the squad ready to go on the field will be essential, the coach acknowledges that, after a difficult year for the club, he needs to rebuild the team spirit as well if they are to compete at the right end of the table. “It’s going to be a different pressure on us because we’re coming out of Division One and everyone will think that we’re one of the favourites for this league. It’s a tough division,” March said. “We’re just on a rebuilding job, we’ve got a young side and we just want to go into every game with a lot of effort, good discipline, and hopefully we can compete. “But if we don’t, players will fall out and we don’t want that. We want players to be committed to this club and a tight group, because if we’re a tight group then the results will take care of themselves. March has plenty on his plate this year after being offered the role of head coach with Featherstone Rovers’ new reserves side, and with first team coach Ryan Carr only recently arriving in the country from Australia, he has been in full charge of the Championship side for most of the off-season. “It’s been tough, having training Tuesday and Thursday night, Saturdays with the first team, and building the new reserve side over there as well,” he said. “With the coach Ryan Carr not coming until two weeks ago, it’s been a busy nine or 10 weeks, but I’ve got through that now. “My workload’s going to be just as busy, but obviously Ryan is there to take the team now and I can concentrate on what I need to do with the reserves, being assistant coach, and playing for Shaw Cross Sharks. “I’ve got a massive thank you to Mat Cawthron and Danny Flowers. They’ve stepped up with my busy workload at Featherstone and done a great job. Featherstone have also profited from the Sharks with three players earning a place in their reserves side for this season and one of those, centre Brendan French, now signed up on a permanent deal. “Frenchy got the player of the year (for Shaw Cross) last year and I think he just needs to commit himself to 12 months in a professional environment,” he said. “I think that will make him better. He’s already looking different; his body shape is changing with training with the first team. Shaw Cross will still have the services of the two players in March’s Featherstone side though, with full-back Sam Ottewell and winger Nathan Wright in both squads. As for March himself, the ex-Super League half-back believes that he can still carry on his playing responsibilities for a number of years to come. “Until I have to stop, I’ll carry on,” he said. “Once I retired (professionally) I was just coaching for another couple of years and I felt that I had things to offer, and I think, using my brain, I’ve got a lot more years in me.